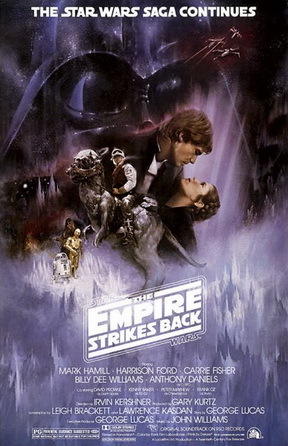 Star Wars: Episode V - The Empire Strikes Back opened in theatres across the United States on this day back in 1980. The now 37-year-old film was released as a sequel to the highly acclaimed Star Wars: Episode IV - A New Hope. Irvin Kirshner, who sadly passed away back in 2010, was the film's director with the franchise's pioneer George Lucas composing the story. The leading stars of the first film - Harrison Ford, Mark Hamill and Carrie Fisher - all reprised their respective roles as Han Solo, Luke Skywalker and Princess Leia. New additions to the Saga, who would soon become cult icons, included characters Lando Calrissian (Billy Dee Williams) and Yoda (voiced by Frank Oz. What are you favorite moments from The Empire Strikes Back - a film that many fans consider to be the best in the Star Wars Saga?